We are involved in manufacturing a wide range of Shop Fittings, which are used in retail malls and jewelry showrooms for displaying jewelry and watches. Our range is available in various sizes, shapes and patterns and are specifically designed to enhance the charm of the displayed item. These shop fittings comes in various materials and can also be custom designed as per the requirements of clients. Our home appliance displays are widely appreciated for features like excellent finish, durability and adjustable heights.We can provide these to our clients in various sizes, shapes and patterns for their varied requirements. 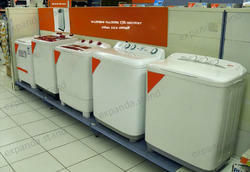 Storage Capacity Up to 150 Kg/Shelf. 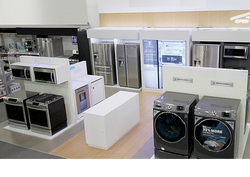 Racks for Home Appliance Display products like television, washing machines are specially designed, keeping in mind the weight of the products. These electronic product displays are available in different height and sizes. These electronic product displays comes in various colors and customization. 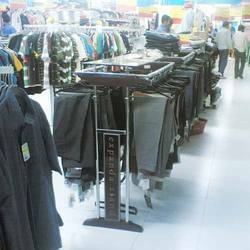 We are manufacturing and supplying garment displays, display Garment Displays racks which are widely supplied to various showrooms, malls and stores. These display garment racks are widely appreciated owing to their elegant designs, adjustable height and durability. We can offer these display garment racks in customized specifications as per the client’s requirements. 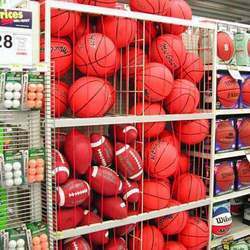 We are offering to our clients, Sports Showroom Displays which are used widely for display of various products in malls, showrooms and shops. Our fittings are widely appreciated for features like excellent finish, durability and adjustable heights. We can provide these to our clients in various sizes, shapes and patterns for their varied requirements.